USTA Colorado’s Team Colorado is a two-tiered program developed to supplement a junior player’s existing personal training regime. While each player’s primary development takes place with his or her personal coach, Team Colorado provides our juniors the opportunity to come together and train as a team. As a program of USTA Colorado, Team Colorado has an overriding theme that’s designed to facilitate high quality training, teamwork (amongst players, coaches and parents), character development, sportsmanship and ultimately pride in being a developing junior in Colorado. We believe strongly in the importance of good sportsmanship. Players, parents and coaches all share in the responsibility of ensuring that good sportsmanship is an integral part of training and competition – regardless of level of play. Geared for those players 7–10 years old, this squad will work on the athletic skills associated with and necessary for successful development of a young athlete; stroke production, movement and tactical competencies (skills). With practices primarily conducted on the 60’ court with orange balls, our goal is to help these players achieve those competencies necessary to successfully transition to the 78’ green ball court. Parent education, player evaluations and a mental skills component are included. This group will consist of players roughly between the ages of 9 and 12 years old and will primarily train on the 78’ court with green balls. Continued work on athletic skills, movement, technical and tactical competencies is the objective in preparation for the transition to the yellow ball. Additional emphasis will be placed on strategy — offense, defense, switching between the two, etc. Parent education, player evaluations and a mental skills component are included. A ‘Skills Challenge’ will be used to ensure that players meet the desired developmental criteria for player squads. Selections will be based on a player’s individual level of development – their tennis skills as well as their athletic skills; agility, balance, coordination, strength and speed. Players will participate in off court athletic skills, on court drills and point play. The atmosphere will be both fun and encouraging. ALL PLAYERS WILL BE VIEWED WITH OTHERS OF SIMILAR AGE. 10 AND UNDER PLAYERS WILL HIT WITH THE ORANGE BALL AND COACHES WILL SHIFT THEM TO GREEN IF THEY FEEL THE DESIRED SKILLS ARE PRESENT. 12 AND UNDER PLAYERS WILL START ON GREEN BALL AND COACHES WILL MOVE THEM TO YELLOW BALL COURTS ACCORDINGLY. Team Colorado selections will be based on a player’s acquired skills – NOT their ability to win at this point. New to our Team Colorado offerings are the Competitive Training Squads (CTS). These squads bring together the most skilled Colorado juniors, ages 14 and under to train together with the depth, focus and intensity of a Division I college level program. Coached by two former WTA professionals (Meike Babel and Meredith McGraff), the CTS squads have been designed to prepare these players for the highest-level sectional, national, ITF and eventually, college competition. The Sectional Training Squad will consist of players who are already competitive at our sectional level events (L3s and 4s) and who’s sights are set on breaking into National level play outside of the section. The National Training Squad consists of highly developed players who are already qualifying for National level events (L1s, 2s and 3s) outside of our Section. Selections for our competitive squads are made by our team of coaches. Guidelines are used whereby the size of each year’s squad is based on meeting those guidelines — not by filling a roster. 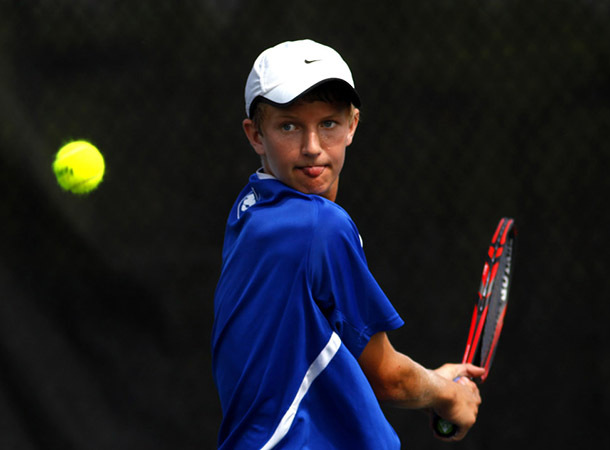 Tournament results, sectional standings, head-to-head play and Universal Tennis Ratings (UTR) are the primary sources used to gather player information. Players will receive invitations to participate in these squads. 2019-20 Team Colorado practices will begin in September and run through the end of April at various locations in and around Denver. Dates and locations will be announced when they become available. For additional information regarding Team Colorado, please contact USTA Colorado Player Development Director Cindy MacMaster.